MPEG-1 Audio Layer 3 or MPEG-2 Audio Layer 3, more commonly referred to as MP3, is a patented encoding format for digital audio which uses a form of lossy data compression. It is a common audio format for consumer audio storage, as well as a de facto standard of digital audio compression for the transfer and playback of music on most digital audio players. The simplest type of MP3 file uses one bit rate for the entire file ¨C this is known as Constant Bit Rate (CBR) encoding. Using a constant bit rate makes encoding simpler and faster. However, it is also possible to create files where the bit rate changes throughout the file. These are known as Variable Bit Rate (VBR) files. The idea behind this is that, in any piece of audio, some parts will be much easier to compress, such as silence or music containing only a few instruments, while others will be more difficult to compress. So, the overall quality of the file may be increased by using a lower bit rate for the less complex passages and a higher one for the more complex parts. With some encoders, it is possible to specify a given quality, and the encoder will vary the bit rate accordingly. Users who know a particular "quality setting" that is transparent to their ears can use this value when encoding all of their music, and generally speaking not need to worry about performing personal listening tests on each piece of music to determine the correct bit rate. Several bit rates are specified in the MPEG-1 Audio Layer III standard: 32, 40, 48, 56, 64, 80, 96, 112, 128, 160, 192, 224, 256 and 320 kbit/s, with available sampling frequencies of 32, 44.1 and 48 kHz. MPEG-2 Audio Layer III allows bit rates of 8, 16, 24, 32, 40, 48, 56, 64, 80, 96, 112, 128, 144, 160 kbit/s with sampling frequencies of 16, 22.05 and 24 kHz. MPEG-2.5 Audio Layer III is restricted to bit rates of 8, 16, 24, 32, 40, 48, 56 and 64 kbit/s with sampling frequencies of 8, 11.025, and 12 kHz. Because of the Nyquist/Shannon theorem, frequency reproduction is always half of the sampling frequency, so 8 kHz sampling rate limits the maximum frequency to 4 kHz, while 48 kHz maximum sampling rate limits an MP3 to 24 kHz sound reproduction. MP3 is the most common way to store music. However, some devices don't play MP3 files, such as CD player in car. So, you need to burn your favorite MP3s to CD and get the music played on CD. The easiest way to burn MP3 to CD is using Windows Media Player. The WMP is built in Windows 7 and Windows 8. So you don't need to install extra software to burn MP3 to CD. 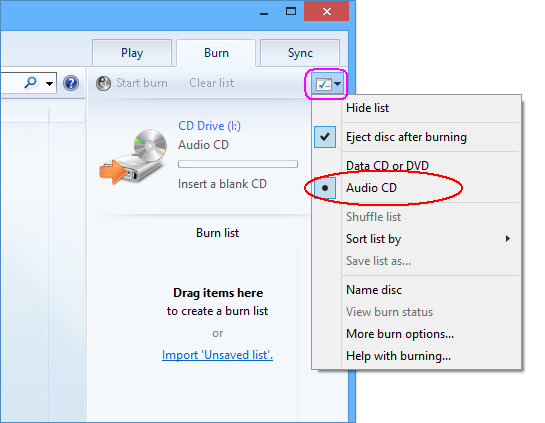 Note: You need to make sure "Audio CD" is checked at Options before burning. Audio CD can be played in most computers and in home and car CD players that play CD-R and CD-RW discs. Refer to the following screen shot. 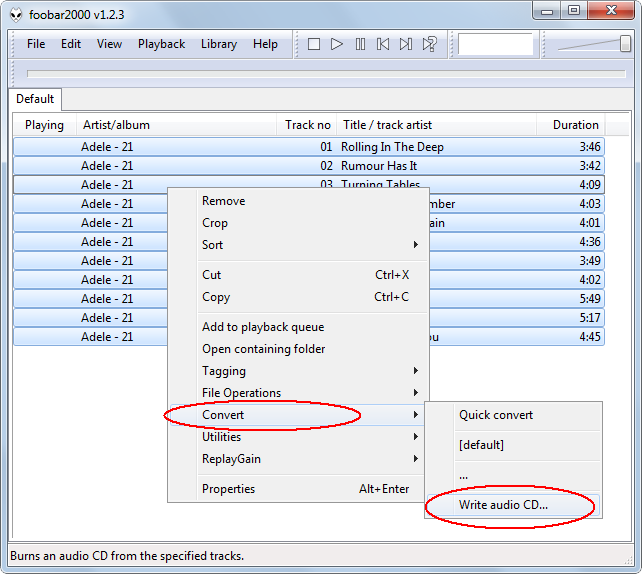 Another easy way to burn MP3 to CD for free is using foobar2000 freeware. 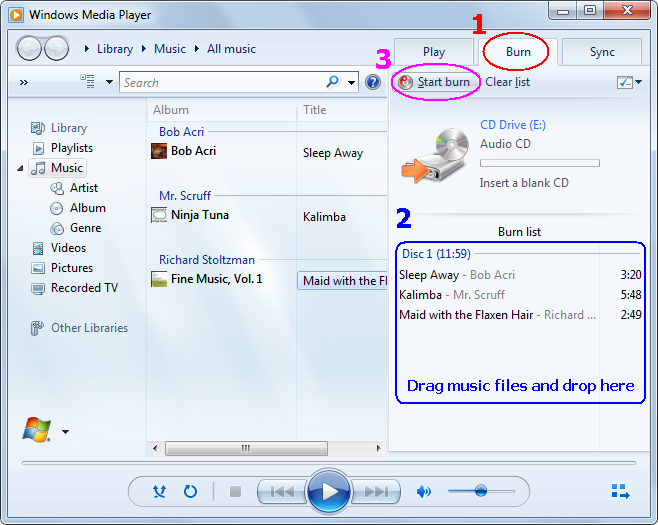 Refer to article Burn FLAC to CD with Free FLAC to CD Burner Freeware. The foobar2000 is fully compatible with Windows 7 and Windows 8. If you're still using Windows 2000 or Windows XP, you can burn MP3 to CD with another freeware. It's Burrrn. 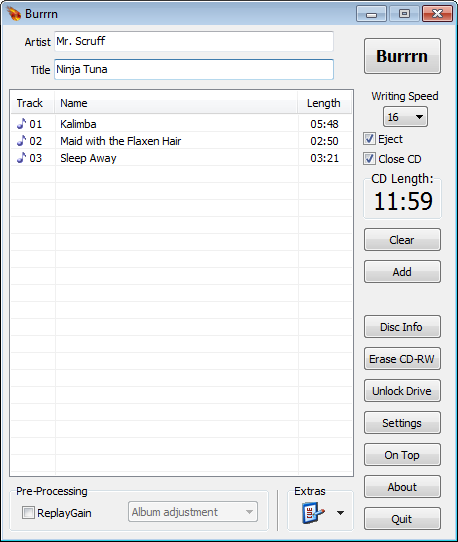 The Burrrn freeware supports both CR-R and CD-RW discs. You can set writing speed from 1x to 52x. It's possible to erase CD-RW disc with the freeware. The Burrrn freeware supports ReplayGain pre-processing. So you will get same volume for different music when playing music. The freeware also supports multiple languages such as Bulgarian, Catalan, Chinese, Croatian, Dutch, English, French, German, Greek, Hungarian, Italian, Japanese, Norwegian, Russian, Slovak, Slovenian, Spanish, Swedish, and Turkish.